3herosoft PDF to Text Converter for Mac is a standalone program which can extract Text from PDF documents without assistance of any third-party program, such as Adobe Acrobat or Adobe Reader. It will provide you a direct way to convert PDF to text files. Then you could edit the content with the Notepad or Microsoft Office conveniently. With 3herosoft PDF to Text Converter for Mac, users can all the original text, layout, tables, etc. with be preserved, therefore there is no need for you to be worried about the quality loss. More conveniently and easier, 3herosoft PDF to Text Converter for Mac allows you to convert only the needed pages to text by setting the page range. *Support batch conversion and partial conversion for saving time. 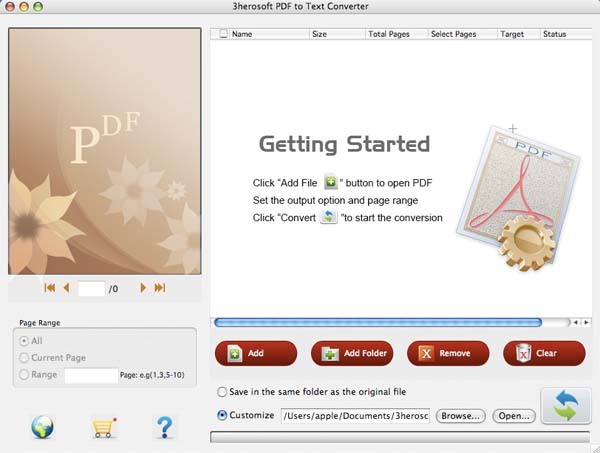 3herosoft PDF to Text Converter for Mac can extract Text from PDF accurately with the original text, layout, tables, images, etc. preserved. You are flexible to specify a page range and convert only the needed pages to Text, in this way, the conversion time will be greatly shortened. Batch conversion for saving time To save more time, you are free to convert multiple PDF files simultaneously, and 3herosoft PDF to Text Converter for Mac will also ensure you fast processing speed. You can preview the file effect in the view panel page by page, and choose which pages you want to convert. Convert PDF to Text on mac OS X, so you can edit and reuse your PDF content. 3herosoft PDF to Text Converter for Mac is able to convert PDF to Text Converter independently without requiring any other program or plugin for assistance. Multi-language PDF files are supported by 3herosoft PDF to Text Converter for Mac, the input files can be English, Turkish, Thai, Latin, Korean, Greek, Cyrillic, Arabic, Japanese, and Chinese.